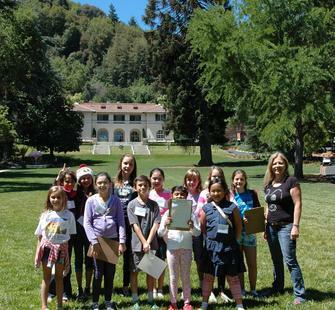 Frequently asked questions about Montalvo's Summer Camps. Have additional questions that aren't answered here? 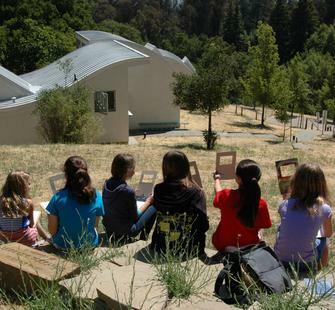 Email camp@montalvoarts.org or call 408-961-5854. How many Summer Camps are you offering in 2018? We are offering 29 total camp sessions. What sets Montalvo's camps apart? We offer camps that are . . .
What is the daily camp schedule? The physical and emotional safety of our campers and staff are central to Montalvo’s camps and vital to its overall mission. As such, we take the issues of bullying, harassment, and violence very seriously. Bullying is generally defined as when one or more people maliciously exclude, tease, taunt, gossip, hit, kick, or put down another. Montalvo’s leadership investigates any and all allegations of bullying, and trains camp supervisors to promote positive communication, so that students can feel comfortable voicing their concerns to staff. By working together as a team to identify and manage bullying, we can help ensure that everybody has a great experience here at Montalvo. Who is teaching the camps and/or watching my kids? Our teachers are professional teaching artists who work both as artists and as educators – all are finger-printed, background-checked, and sign our child abuse prevention agreement. Each class also has a teaching assistant (camp lead) who has education and/or arts experience and is also finger-printed, background checked, and signs our child abuse prevention agreement. High school volunteers also help with the camps and work with the children but are never left alone with a camper. The camp-lead-to-student ratio averages 1:10, max capacity is 25 per camp. What is the best way to contact camp personnel? What is the difference between the age designations? How strict are the age policies? We do make concessions to accommodate patrons. Please contact the Box Office to discuss options for your child: 408-961-5858, 10am-4pm, Monday-Friday. Students must have completed Kindergarten to register. We are generally able to be flexible within a year of the age requirement. In cases of siblings who want to be together and are in two different age groups, please call to see if we are able to accommodate your needs. Regardless of what camp sessions they’re in, siblings will be able to have lunch together if they are here all day. If Montalvo is waiving the age requirement for my children, how do I register them in UltraCamp? Please do not put in a false date for the child when you’re registering! Contact the Box Office or Camp Staff for assistance with your registration. Why can’t I proceed to the next page in my UltraCamp registration? You may have to scroll to the bottom of the page to find the NEXT button. If you're having trouble, contact the Box Office and we can help guide you through the process. What has to be completed to enroll in camp? What happens once a camp sells out? When you register for a sold-out camp online, choose the “sign up for wait list” option and you will be automatically placed on a wait list through our registration site. The moment we have an opening, you will be contacted via email and will have two (2) days to complete your registration. Camp staff makes as many available spaces as possible and, if camps are especially popular, may open more spaces. There are! 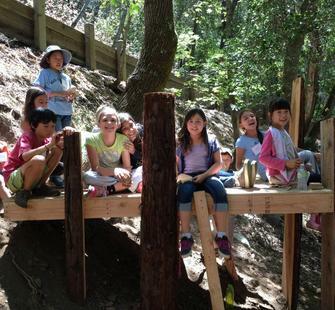 For more information, contact the Education Department at 408-961-5858 or camp@montalvoarts.org. You can also fill out a scholarship form here and we will get back to you. Are there discounts for members? No, but Montalvo members get early registration privileges. Where do I drop-off/pick-up my child? Drop-off and pick-up location for pre-care and after-care is in Parking Lot 2. Proceed up the entrance road toward the Villa and turn right in front of the "Sobrato Circle" sign at Lot 2. Once parked, please follow signs to extended care, which is located in our cottage studios. Locations will be emailed to students’ parents as one week prior to the start of camp. Where does lunch take place? Lunch will be on Montalvo's grounds (exact location will vary) and will be supervised by camp staff. Are lunch/snacks provided as part of the camp? No. Please provide your child with a lunch. What happens during the break between morning and afternoon camps? 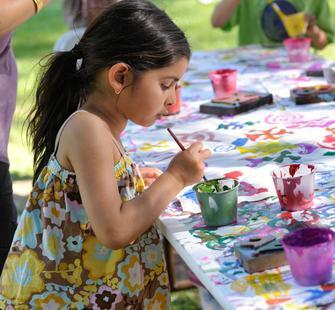 When you sign up for both a morning and afternoon half-day camp during the same week, a lunch supervised by Montalvo camp staff will take place on the Great Lawn from 12-1pm at no additional charge. Students must bring their own lunch. Why does the You Can Ukulele camp cost more than the other half-day camps? The registration cost includes a ukulele, which each camper gets to keep! Is previous experience required for any camps? No. Previous experience in music, art, theatre, dance, or with specific tools is not a requirement and all students will further their current skill sets and explore new ones. Some camps are geared for ages 9 and up to best group students for instruction.